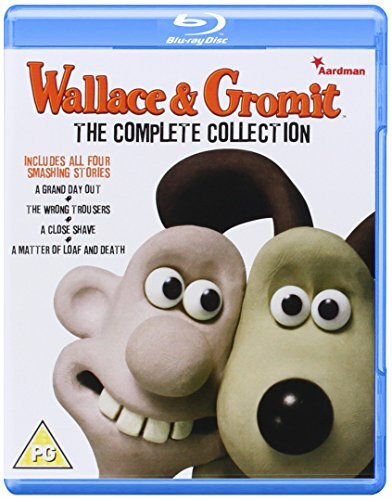 Celebrating the 20th Anniversary of Wallace and Gromit - the Academy Award (Oscar) - winning claymated pair have specially re-mastered all four of their smashing half hour specials in this complete collection!Titles Comprise:A Grand Day Out: Wallace likes a nice bit of cheese with his crackers, so when this eccentric inventor finds his fridge empty and the local corner shop shut for the Bank Holiday, he is forced to look further a field for his cheddar. The two modelling clay heroes blast off in their home-made rocket on the ultimate day trip - Wallace and Gromit are off to the moon!The Wrong Trousers: This time the modelling clay stars are plunged into a hilarious tale of skulduggery involving an extraordinary pair of automated trousers and a villainous penguin. Posingas an innocent lodger, the fiendish fish-eater sets about recruiting mild mannered Wallace as an unwitting accomplice to his dastardly plot - a diamond heist with atechnically advanced, trouser-inspired difference. It is left to Gromit to turn detective and save the day as malice and mayhem culminate in a breathless train-top chase -around the sitting room!A Close Shave: Trade is booming for Wallace and Gromit's Wash'n'Go window cleaning service and love is in the air as Wallace falls for the owner of the local wool shop, the lovelyWendolene. But Wallace has a new incentive - a Knit-O-Matic machine - and adventure looms. Sheep are being rustled, wool is in short supply andWendolene's malevolent pooch is on the prowl... featuring Shaun the Sheep!A Matter Of Loaf And Death: Wallace and Gromit have opened a new bakery - Top Bun - and business is booming, not least because a deadly Cereal Killerhas murdered all the other bakers in town. Can Gromit save his master from becoming the next baker to bebutchered?